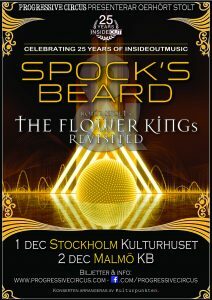 It’s basically impossible to discuss the so called third wave of progressive rock without mentioning it’s flag-bearers SPOCK’S BEARD (US) and THE FLOWER KINGS (SWE). Both bands were formed when prog was about as unhip as ever in the early 1990’s, but have since the start held an impressively high quality through a long line of album releases and are today undisputed legends in the progressive rock genre. Apart from being in these great bands, the long line of accumulated band members have somehow infiltrated a major part of the prog scene, including projects and collaborations with names like Genesis, Steve Hackett, Jon Anderson, Transatlantic, Karmakanic, The Tangent, Pain of Salvation, Agents of Mercy, Kaipa and Kaipa da Capo. 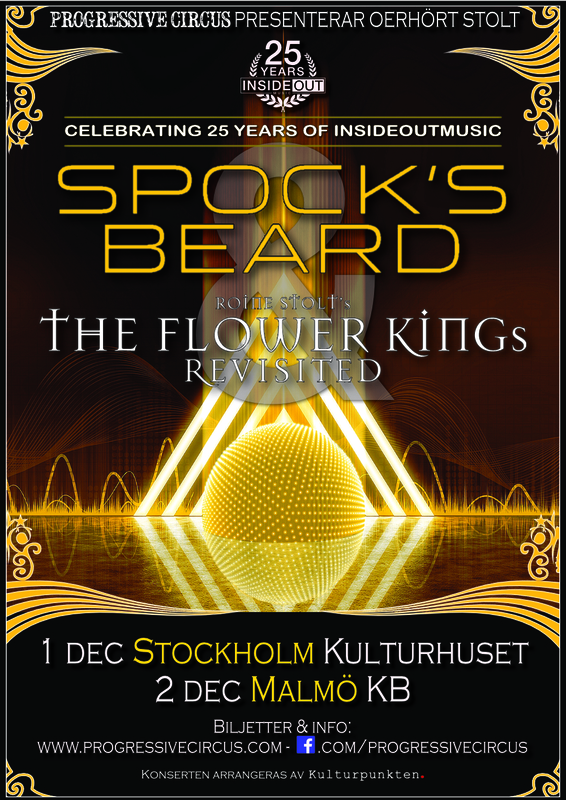 Although many of their albums are modern classics, the ultimate Spock’s Beard and Flower Kings experiences have always been at their concerts, and therefore we cannot think of a better combination of bands to celebrate the 25 years of prog’s number 1 record label InsideOutMusic! SPOCK’S BEARD were formed in 1992 in Los Angeles by the brothers Neal and Alan Morse on vocals, keyboards and guitar, soon joined by Nick D’Virgilio on drums, Dave Meros on bass and Ryo Okumoto on keyboards. The debut ”The Light” is a four track full-length masterpiece, mixing a lovely Chris Squireish Rickenbacker bass with Keith Emersonish organ playing, Genesis style compositions and Gentle Giant vocal arrangements. It gave new hope to prog fans that were about to give up on music. The band gained a quickly growing fan base, that were surprised to see founding member and primary composer Neal Morse leave the band just after their double concept album Snow (2002). However, the band quickly proved that they could continue to do superb music. In 2011, singer Ted Leonard made an impressive debut concert at the bands third and last visit to our country, at Sweden Rock Festival. Three strong studio albums have followed since, with the latest ”Noise Floor” just released! For their short European visit in 2018, the band will bring Mike Thorne of SAGA on drums. THE FLOWER KINGS came to be when former KAIPA guitarist Roine Stolt put together a new band in 1994 to promote his solo album ”The Flower King”. Ever since the first note until today, the band has held an incredible high level of virtuoso musicianship and songwriting, with compositions ranging from a few seconds to an hour. Just like with Spock’s Beard, The Flower Kings were highly profilic in re-vitalising the then declining prog scene, due to an impressive production speed with ten magnificent albums released from 1995 to 2007, of which four are double albums. After two praised comeback albums in 2012 and 2013 and following tours, safe sources have indicated that The Flower Kings were no more. But in December 2018 you will once again have the chance to see the floral monarchs, in a shape that as always is conducted by mastermind Roine Stolt on guitars and vocals, alongside the musical beasts Jonas Reingold on bass and Hasse Fröberg on guitars and vocals. Stay tuned for final line-up anouncement later on. The Flower Kings: Stardust we are (1997), Unfold the Future (2002), Banks of Eden (2012). For both dates, doors will open 19.00 and concerts start 20.00. The event is arranged by Kulturpunkten.